As with Hill Climbing events, Trials competitions are seeing a resurgence here in the Pacific Northwest. Opinions vary on the reason for this, ranging from the rebound in the economy to new blood entering the sport from the bicycling world. But whatever it may be, it's good to see a growth spurt in one of the most challenging sports on two wheels. 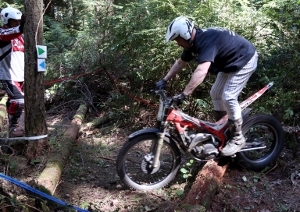 Observed Trials competition involves riding a motorcycle over logs, rocks, up steep grades, and around varied obstacles, while keeping your feet glued to the pegs the entire time. Once your foot is 'observed' coming off the peg you begin losing points. Since riders are standing most of the time, seats are minimal on trials purpose-built bikes. Back in the day, when the competition saw popularity around the globe ('60s and '70s), companies like Montesa, Bultaco and OSSA were involved. Honda later entered the scene, as did Yamaha, Kawasaki and Suzuki with purpose-built machines. Today the popular manufacturers include Sherco, Gas Gas, Beta and still Montesa (a Honda-owned company now). So why is it one of the most challenging of all motorcycle competitions? A rider needs balance and plenty of it. As Brian Clark, the president of the Columbia Observed Trials Association (COTA) puts it - "If you're coming from another area in motorcycle competition, the learning curve is lengthy to become a good competitor. However, if you're moving from Trials to another competition, all those balance skills allow you to accelerate through the learning process of the next type." Clark likens Trails to golf referring to it as an 'equity' sport in that is requires many hours of practice to master the skills needed to compete. Competitions in the Northwest are seeing a growth pattern right now. The Puget Sound Trialers have upped their number of annual events as has COTA and the Inland Northwest Trials Association. But it hasn't been easy. The majority of events are now held on private land, and securing rights to hold events in such places has taken time to build a network of individual land holders willing to provide their properties for competitions. Keith Ruttledge with the Inland Northwest Trails Association points out, "Nearly all our competitions are held on private land today." Oddly enough, a church camp owned by the Crista organization, Island Camp, between Poulsbo and Silverdale, has become available as a rental space, which the Puget Sound Trialers utilize with frequency. Other private lands are located across Washington, Oregon, Idaho and British Columbia. Last year the LeMay Marymount Center hosted a leg of the AHRMA national trials competition on their vast property in Tacoma. The same will happen this year in June. Some competitions are still held on public lands. COTA utilizes the Tillamook State Forest and a section near Mt. Hood's Lolo Pass, which is on USFS land. Above: A vintage Yamaha rider gets in the act at a recent Island Camp competition. And while trials riding isn't for everyone, it makes a great spectator sport. You need a reason to go for a ride on a sunny weekend? Then add trials competition to your list. Unlike track racing, which tends to occur during the spring and summer, trials events can be found somewhere in the Pacific Northwest any month of the year. Use our calendar to find one near you. You need a little cardio workout? Most competitions are staggered across several competition event areas at any one property. While you may not be riding during the competition, you can follow the riders from section to section on foot, which will cook a few calories along the way. A small dealer network exists for riders to purchase and maintain their trials bikes. Most states only have about three shops that specialize in the bikes, but that's enough to supply the users for now. If you, or someone you know, is interested in giving trials riding a whirl, any of the local clubs are more than happy to shepherd you into the sport. 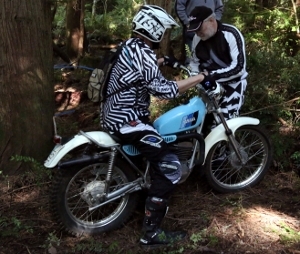 For a list of upcoming trials events in the Pacific Northwest, use the Sound RIDER! calendar, or visit each of the club sites listed below.